Welcome to MMIR Version 5.0! MMIR Read Access is useful for anyone who is interested in aviation safety. You can search existing MMIR reports from the entire database, either by aircraft model or by part number. MMIR lists summaries of all reports for a specific aircraft model or part. All references to the reporting company, aircraft registration, and individuals have been removed. Once you are registered, you may use your e-mail address and password to start searching reports immediately. Remember, with Read Access MMIR, you may look at reports, but you cannot enter or change any information. If you are an operator, repair station, or a certified technician, consider registering for MMIR Full Access. This will allow you to submit warranty claims, service difficulty reports, and mechanical interruption summaries on-line. SDRs automatically forwarded to the FAA; there's no redundant paperwork or mailing involved. MMIR contains tens of thousands of files on thousands of aircraft parts. Type a part number (or a partial number, at least 3 digits) in the text box, and click Search. Note that the "Start Date" and "End Date" automatically default to a one-year search. Change the dates to your preference.
! Tip Partial numbers provide a broader search. 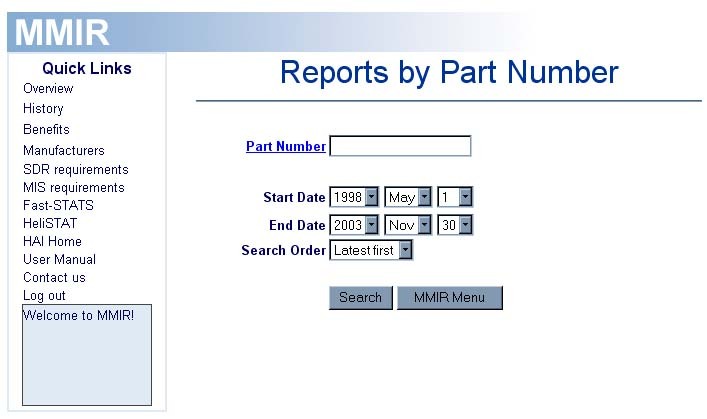 MMIR will display all reports for part numbers that begin with the numbers you enter.
! Tip Punctuation marks, such as hyphens (  ) and slashes ( / ), are automatically removed for search purposes, so there is no need to include them when typing the part number. Some the of results may be labeled INCOMPLETE. This means that the submitter has not finished that MMIR report. Many of the elements may be missing, or subject to further amendment. Although incomplete, these reports may contain useful information, so are included in the analysis query. Want to search all the reports on parts for a specific aircraft model, such as the Bell 206 or the Eurocopter AS350? Easy! Just use the pull-down menus provided to select an aircraft manufacturer and model, and a date range. While MMIR contains predominantly helicopter information, there is some data available for general aviation fixed-wing aircraft. Note that the "Start Date" and "End Date" automatically default to a one-year search. Change the dates to your preference. Sometimes, aircraft model designations are precise to the point of exclusiveness. For example, within MMIR there may be hundreds of reports for the "B" model, but none for the "D7." Certainly there are important distinctions, but the sub-models also share many parts. 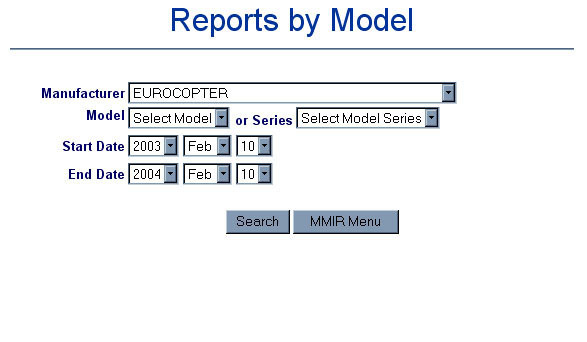 MMIR gives you the option to search for reports based on an aircraft model series.